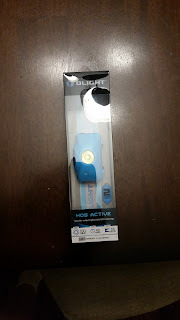 I received this headlamp for review from Olight. I always to my best to make unbiased reviews of products, paid for or gifted to me. The Olight H05 headlamp comes in a plastic box as shown below (sorry for the glare). The headlamp comes with a owners manual, and 2 lithium iron batteries which are supposed allow for 40 hours run time at 10 lumens, which i usually good enough for basic navigation and finding stuff in a pack or at camp. It is capable at running at 150 lumens for 10 minutes and then automatically lowering its self to 90 lumens for up to 280 additional minutes with lithium batteries. For me the advertising for how waterproof it is, is a little misleading in a way. 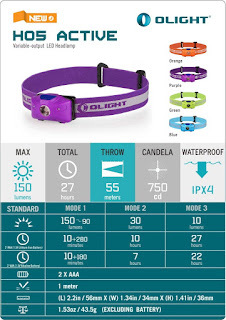 The Olight H05 headlamp is not waterproof, but rather water resistant to splashing. IPX4 or IP04 rating is water spray from any direction. 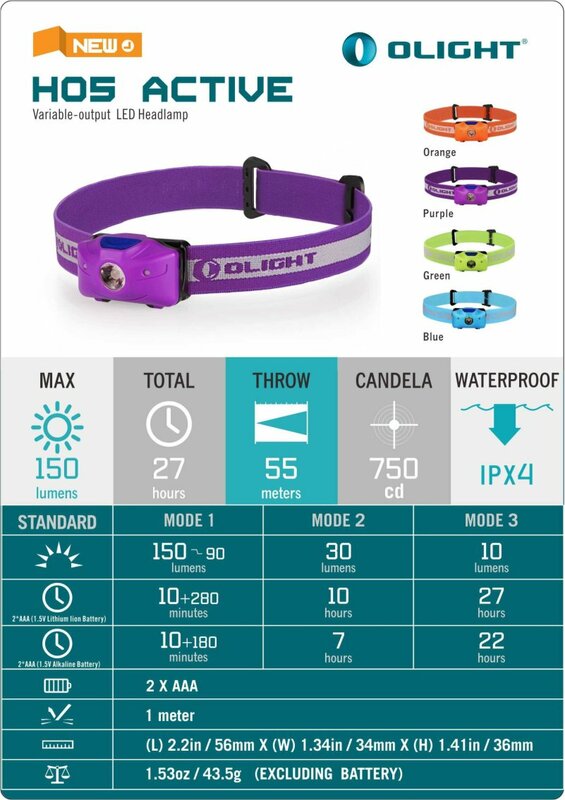 The box my headlamp arrived in does not specify this but this graphic from Olight does, which is as of the date of publishing this review quite prominent on there website. The headlamp is quite attractive and is small in form factor. It weighs 1.9 ounces, with batteries as that is how I would be using it. It comes in 4 colors, Orange, Purple, Green, and Blue like I received. The colors are a little bright for my taste, but I would think would be super easy to find in a pack, or on the ground if dropped. 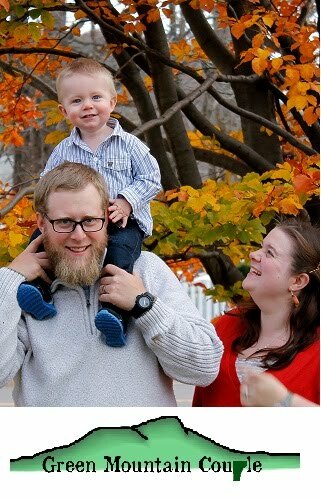 To be honest I wish I would have received the orange headlamp, I am quite partial to orange as a color. The headlamp does come with a 2 year manufacturers defect warranty, which is good but not as good as some of their competitors. Video review of the function indoor, and outdoor with a comparison to another headlamp I own. Prices seem to range between $24.00 and $28.00 depending on the place you purchase it. There are a lot of factors to consider when purchasing a headlamp. What it will be used for, battery life VS how bright it is, how rugged it is and of course aesthetics. Would I have purchased this headlamp for myself? Probably not. I am a fan of Olight, I do own one of the flashlights which I have yet to review. I take certain things into consideration when making my purchases, and this headlamp falls a little short of those standards for me. I do think this headlamp is good for backpacking, getting to and from a hunting spot, but not something I would necessarily by as a survivalist. The Olight H05 is impressive with its normal lighting functions, but falls short with the red lights.